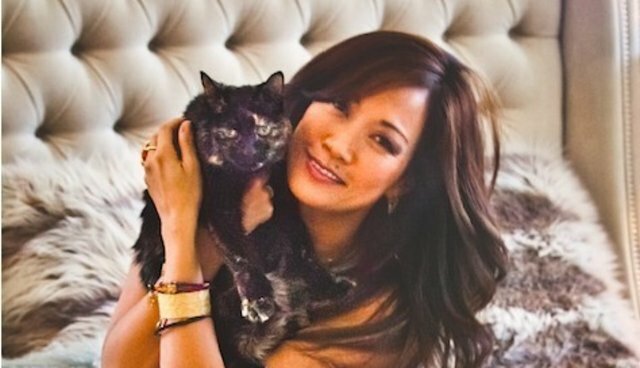 As part of the recently released definitive cat lover's book A Letter To My Cat, Dancing With The Stars judge Carrie Ann Inaba had this to say about her rescue cat, Taz. Dear Taz, I love you. My one-kidneyed medical miracle... your love is like a warm, furry blanket on a cold winter evening. At twenty-two pounds, you are a big pillow of love. If ever there was peace, I have found mine with you, Taz-Man. When you were sick and had those surgeries for your chronic kidney condition, I remember praying to God not to take you, to allow us to have more time together, as I rushed over to the hospital right after the premiere of Dancing with the Stars. In Uggs and my gown, I drove straight to San Diego from Los Angeles and got ready to spend every moment I could giving you my love to show you not to give up. And you didn't. After three surgeries, each a little more risky than the previous one, you always surprised the doctors and came back stronger than ever. As if nothing was wrong. And even now-with your esophageal feeding tube through which I give you water four times a day to keep your kidney strong and healthy-you do not act sick. You do not think you are sick and when I look at you, I see only vibrant health. Because that is your choice. You are strong... and you are pure with your intent to live each day with love and peace in your heart. I have been so fortunate to have been able to share my life with you. That day I found you on the street is one I will always be thankful for. You have been my protector and my friend-my guide to peace and my love pillow at night when life gets me down. You've taught me that love is all that matters. And I'm proud to be your mama. I love you, Tazzie Boy. To read more, you can follow A Letter To My Cat on Facebook and Twitter. Reprinted from A Letter To My Cat by Lisa Erspamer. Copyright © 2014 by Lisa Erspamer Entertainment LLC. Published by Crown Archetype, an imprint of Random House LLC.